Hello friends! Its been a long time since I shared one of my other favorite type of cards – layered & dimensional with a lot of die cutting. I posted this on the Spellbinders blog a few weeks ago and I’d like to share it here as well in case you are not a subscriber of theirs. 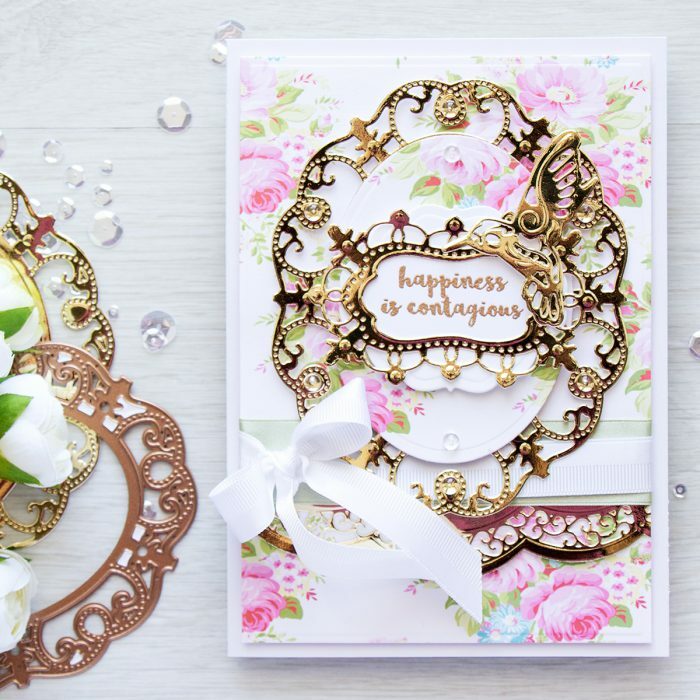 This card features dies from the Botanical Bliss Collection from Spellbinders. 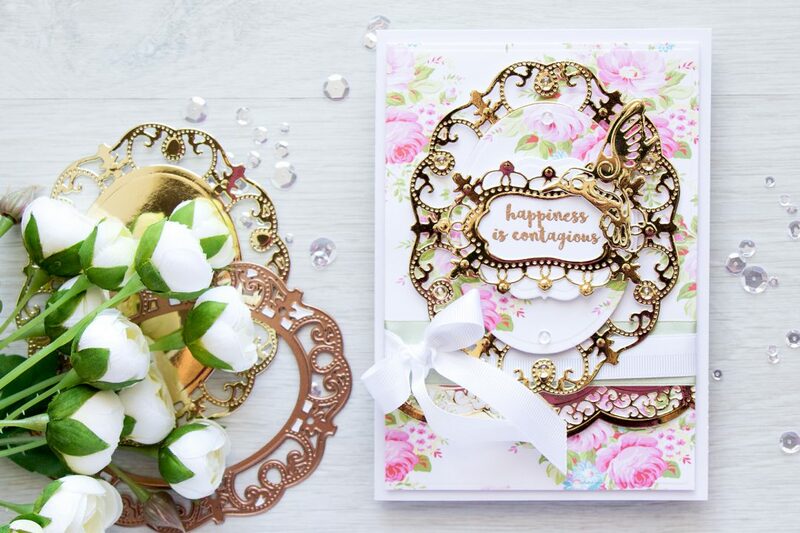 Beautiful elegant designs, perfect for a variety of projects. 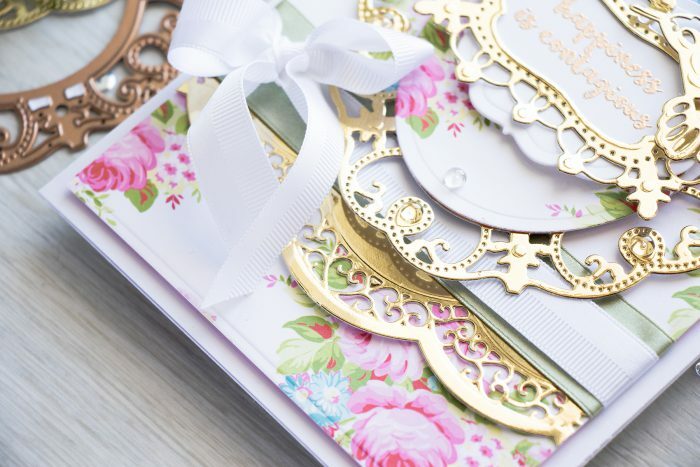 Gold mirror cardstock, pretty patterned paper and fancy dies, what could be better? One of my favorite brands of paper to use with my elegant Spellbinders dies is First Edition Papers by a UK company Trimcraft. You can find their papers in a lot shops in Europe, although is it not so popular in the USA. Unfortunately, the paper pad I used for this card is discontinued, but they do have similar papers in THIS pad. 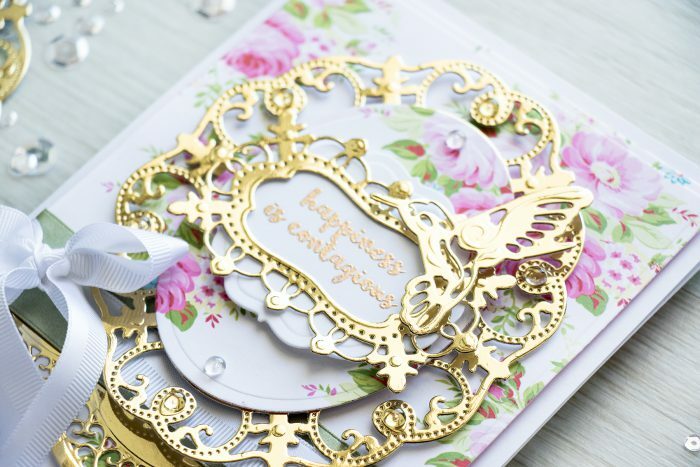 To create this card I used several dies and layered die cuts for a beautiful dimensional look. I’m listing all die sets I used below. My sentiment, Happiness Is Contagious, came from Uplifting Thoughts stamp set from Simon Says Stamp, although any general sentiment works for a card like this. Unlike my previous cards where I mainly used pearls, I went with clear drops from Pretty Pink Posh to add little finishing touches to this project. What a lovely card! Thanks so much for the video and all your special touches!! This is so pretty, Yana! You are so good at clean and simple and then you pop up with cards like this!!! Stunning. Love both styles, but I’m not so good at this type. Love it! So many layers of elegance and beauty. Wow!